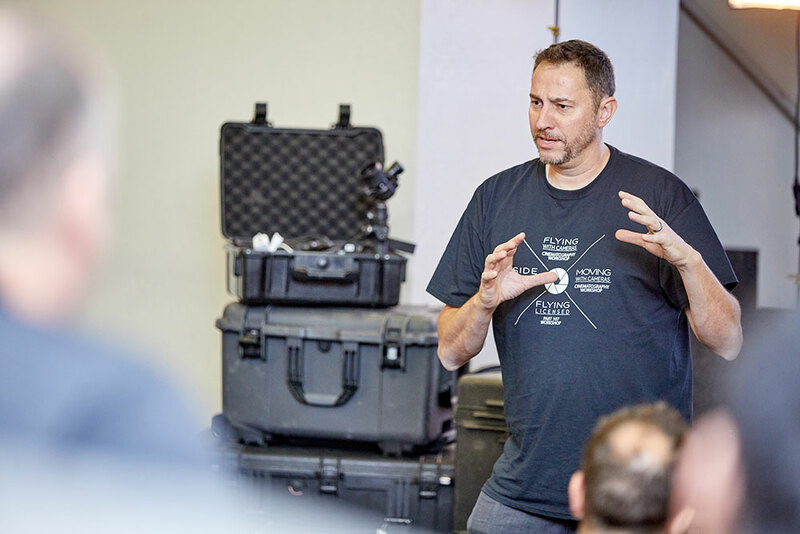 “Moving with Cameras” workshop is structured around hands-on interaction with gimbals alongside in-depth teaching on the psychology and application of movement in cinematography. Camera movement evokes emotion from an audience and learning the art of motion in film is vital to visual storytelling. 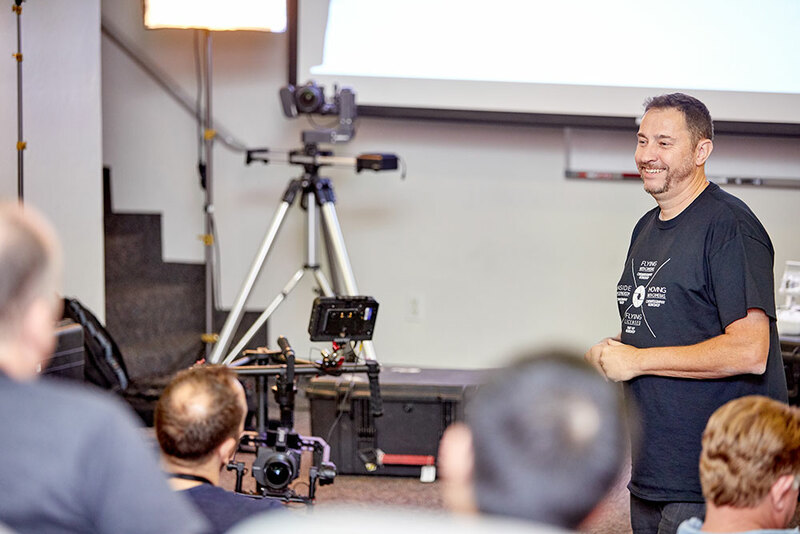 The weekend workshop is designed to propel attendees to a new level of creative cinematography. 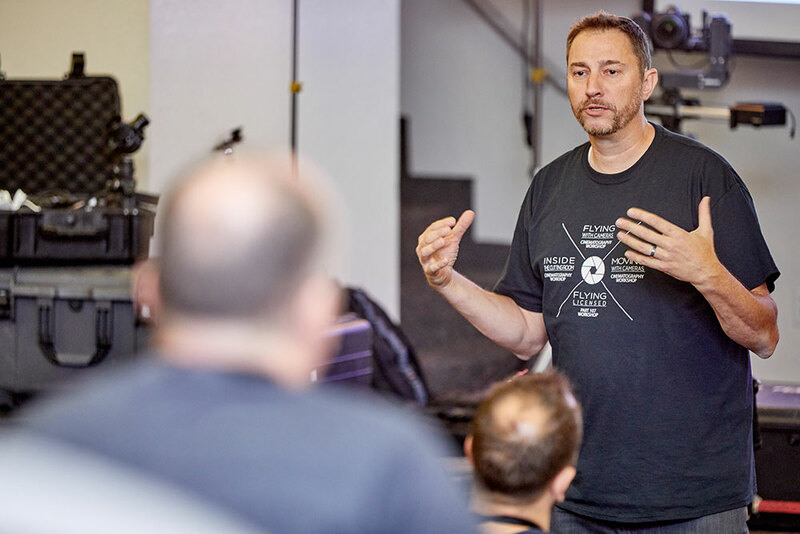 A mix of hands-on equipment techniques and classroom focus on the pillars of the hows and whys of movement will give unique insight for achieving a make-or-break impact on audience response. 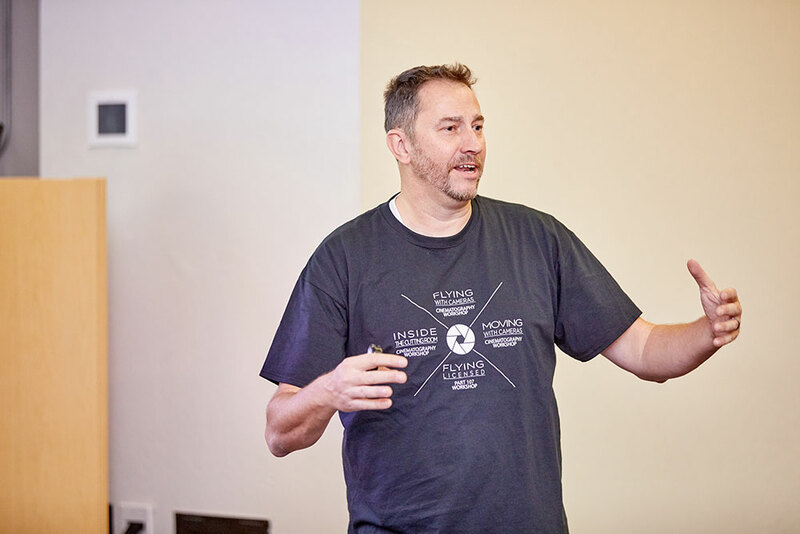 If you are ready to take your storytelling from good to unforgettable by understanding the science of evoking emotion, this workshop is for you. 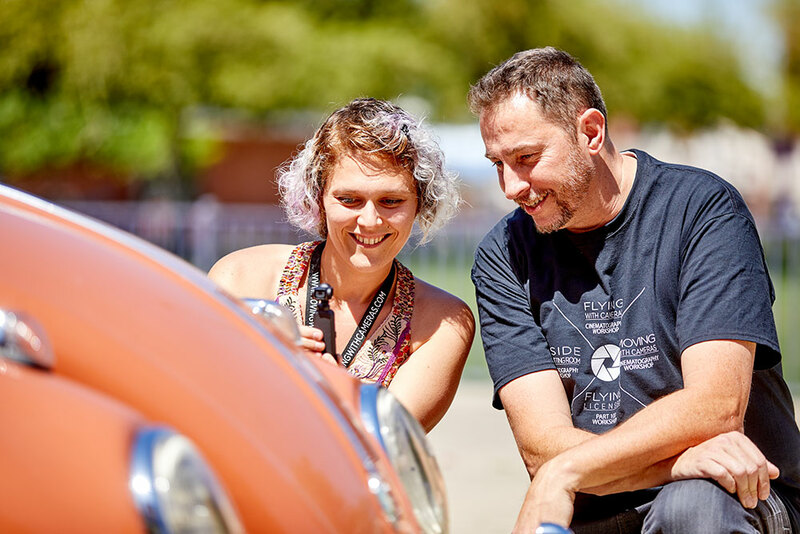 Christophe Tinard is an award-winning video professional with over 14 years of experience in the field. 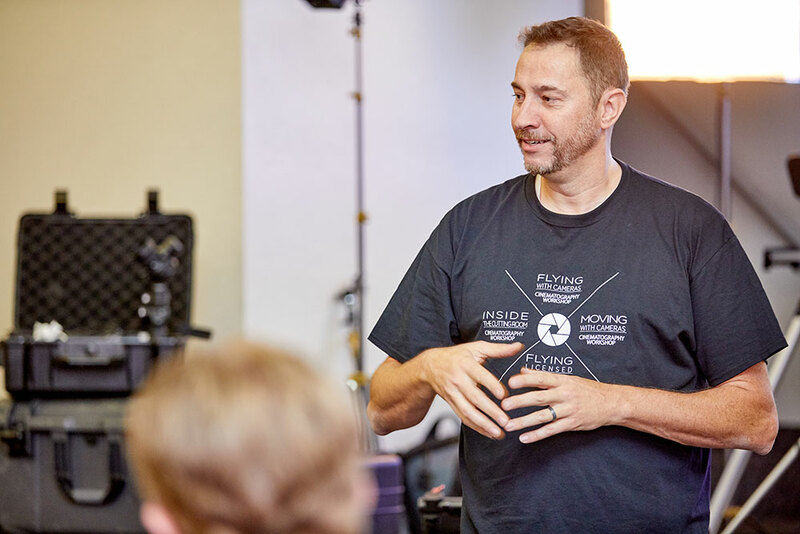 The complexity and array of his projects – from network news to documentaries, advertising and government videos – have given him an insightful voice in cinematography education. 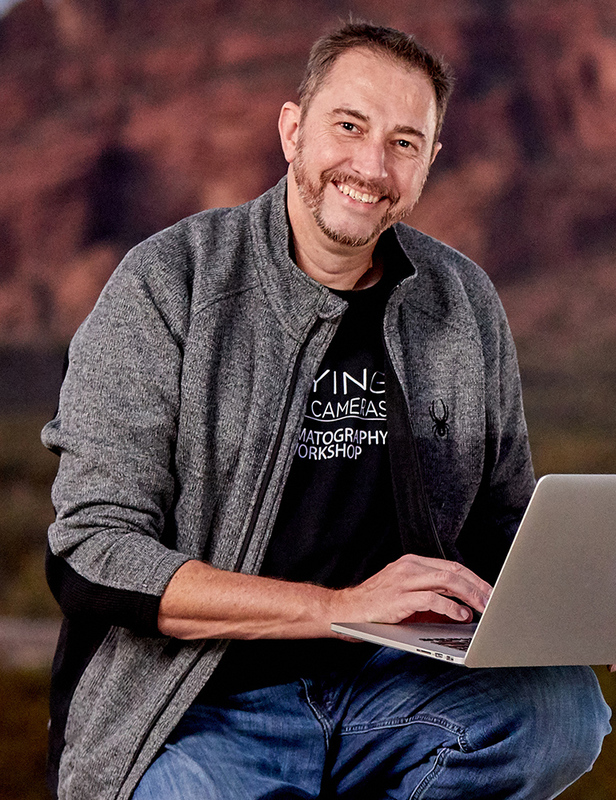 His body of work was recognized in 2017 with a nomination for a Rocky Mountain Emmy Award.™ Christophe is currently Managing Partner and Head of Production at Hire Story, a Scottsdale-based production company specializing in Recruitment and HR related production. Christophe brings his professional background in production, post production, shot composition, technical know-how, and experience into the field of aerial cinematography. He has traveled to film clients all over the nation and earned a reputation for excellence in storytelling through film. Chris brings his unique brand of friendliness and expertise to impart information to others who share his passions: piloting drones, creating beautiful shots, framing techniques, technical know-how and troubleshooting, editing footage, and skillfully expressing a craft that is both an art form, and a way of making a living. The hands-on events were critical to solidifying my understanding of the concepts discussed in the classroom. 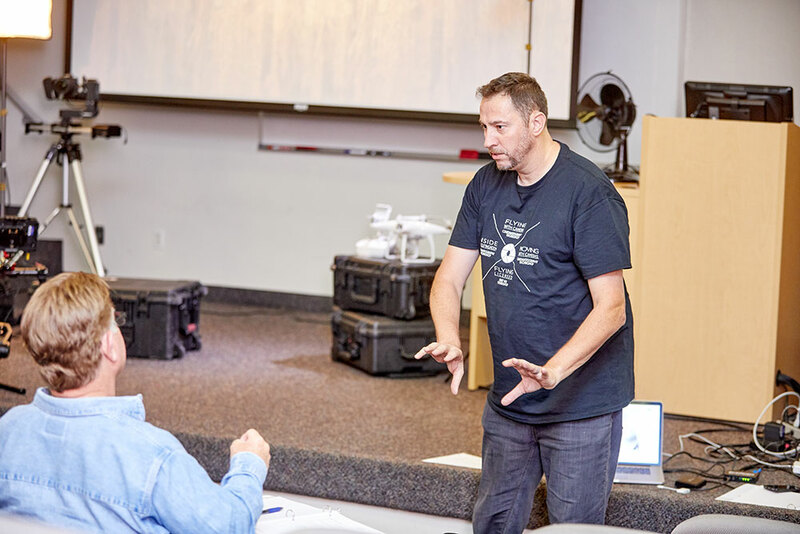 I became comfortable using the gimbal and that made it easier to apply the movement principles taught in the classroom. The classroom presentations were on point and very clear, even for someone new to video. The class was a lot of fun with the perfect mix of classroom and hand-on experience time. 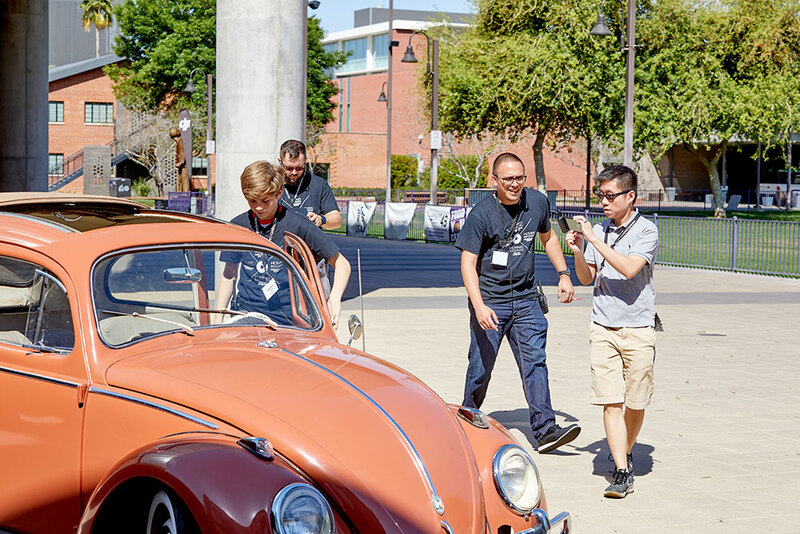 Everyone that is a part of the training is passionate about what they do and are willing to share with you as a participant techniques to make you better. It certainly gets the creative ideas flowing of how you can put what you learned into practice. I would highly recommend this course to anyone who is interested in developing their skills in filming or furthering their career in the profession. As someone who trains for a living, I have been most impressed with your preparation, the quality of the teaching materials, and most importantly, your passion in what you do. The passion to create great things through filmmaking was very remarkable throughout the whole event. Being part of this strengthened my desire to learn more about all the aspects that lead to creating a beautiful moving image. Overall I am happy I took the class. I learned a lot and can't wait to practice and try it out. Chris was able to share his mistakes with us and things he has learned over the years. He makes the learning fun. He has a passion for his work and it shows in his level of enthusiasm when teaching the class. It was awesome, super helpful. Real life stories and examples were great. It was nice seeing examples of when things didn't go right and how you corrected. It was very good and worth the price. Very useful Sunday with some really nice folks. Good, clear and positive instruction. I particularly enjoyed Chris’s honesty, admitting that he still is evolving and growing as an artist. Humility is always appreciated. I had an amazing time. I have more knowledge and confidence going into the field of film. 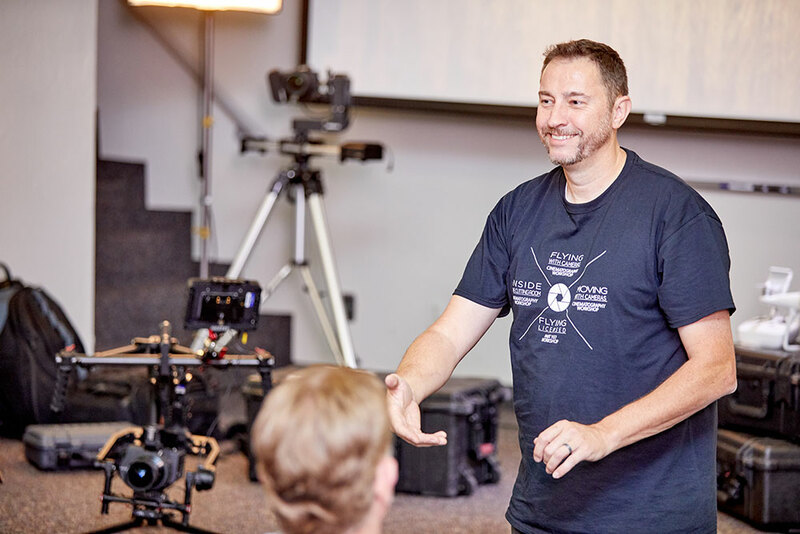 If you are new to cinematography, a hobbyist, or have experience but want to continue honing your skill and talent, Level 1 will give you pro-level access to understanding the hows, whys, and when to move a camera. Learn the techniques used by professionals to capture emotion and tell stories with every shot. Boost your confidence and get hands-on instruction from experienced cinematographers. If you have experience with basic cinematography (or beyond) and find yourself driven to push the envelope of what you can do with a gimbal, Level 2 is for you. Grasp advanced creative camera movement, and advanced techniques to convey emotion. Discover the psychology of visual communication and learn how to keep viewers engaged by using movement. 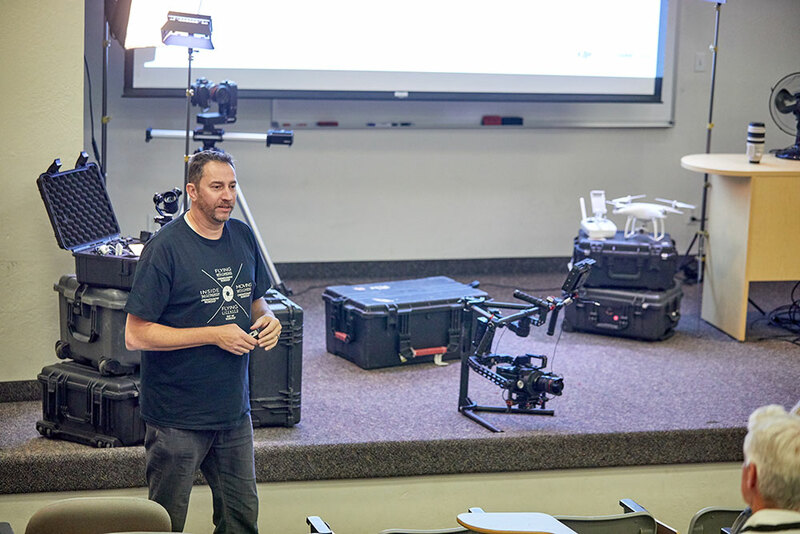 The day includes hands-on gimbal instruction from professionals to take your future productions to the next level. Build on the momentum by attending both days and receive a discount. Sign-up for both Level 1 and Level 2 to gain the most from this experience. Both days are packed with essential information, personal and group hands-on filming time, and a networking lunch both days. Movement in cinematography is key to creating compelling, dynamic storytelling. The balance of two factors are essential: the how and the why. Most workshops focus exclusively on the how. 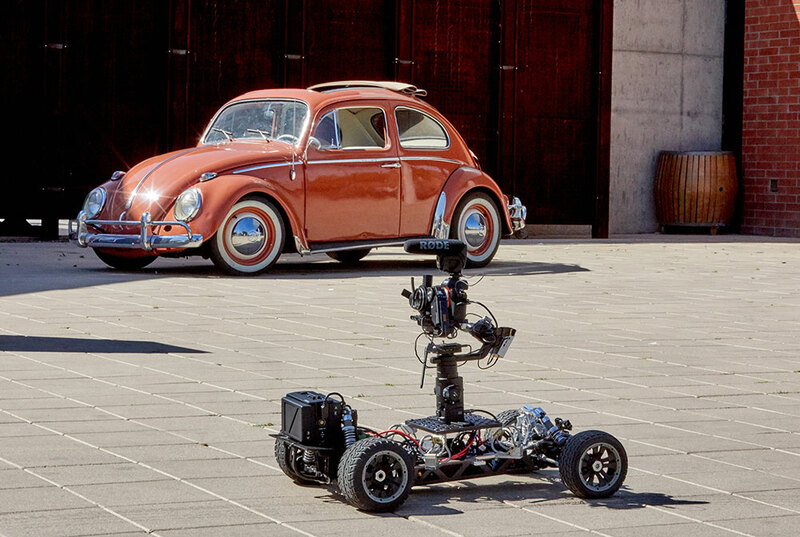 “Moving with Cameras” pushes the boundaries of not only equipment technical know-how, but the underlying purpose, composition, and psychology of persuading an audience. 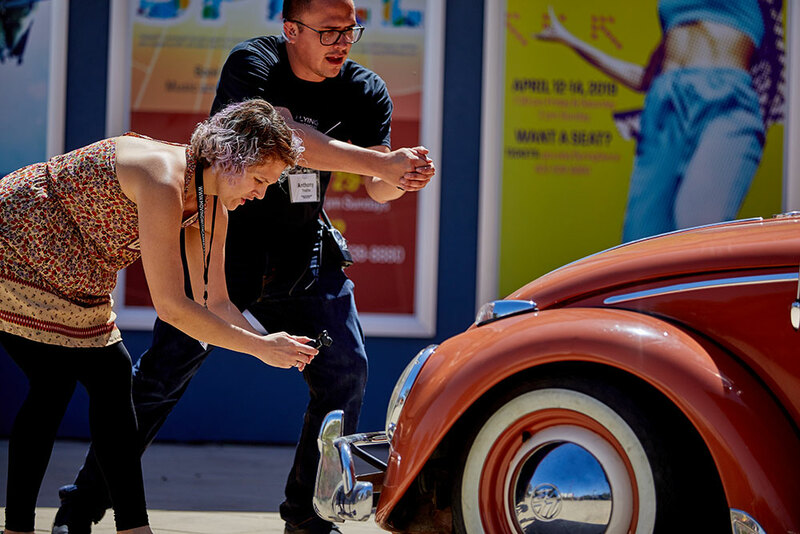 This workshop is designed to build the foundation for great cinematograph through a thoughtful mix of classroom content and hands-on practice. Using real work examples we'll look at how to use camera movement to convey emotions, direct viewers' attention, and tell better stories. Attendees have access to equipment to apply the techniques and concepts learned. 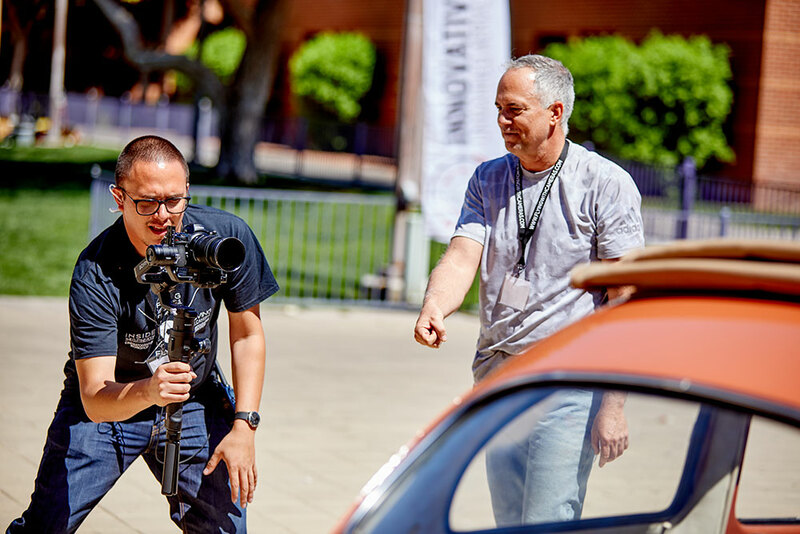 Experience the energy of working in a setting of passionate cinematographers and our crew of experts offering one-on-one and group instruction. If you’re ready to blend visual balance and beauty with the vital understanding of what compels your audience, Level 1 is for you. Learn the basic of photography. ISO, shutter speed, aperture, depth of field, how to use them to produce the final look you want for your shot. Learn how to achieve proper exposure by using different tools to measure your exposure. "Today’s hands on event was very good. I really appreciate your patience in working with me and your excellent instruction." While movement with cameras advances your craft technically, knowing how to move an audience sets a new trajectory for master storytelling. “Moving with Cameras” Level 2 explores the neuroscience behind how choices of movement, pace, and camera placement trigger different parts of the brain. Take your audience from merely viewing a film to resonating with an experience. This workshop is designed to combine classroom engagement with hands-on practice. Using real work examples, we dissect how to create complex camera movements to capture shots that captivate an audience and cause your work to stand out. Grasp vital ways of engaging the viewer, creating reveals, and leading an audience on a path of your choosing. Attendees will handle gimble gear to apply the movement techniques discussed, while our crew of experts give one-on-one instruction during morning and afternoon hands-on sessions. If you are ready to deep-dive into creating emotion and compelling cinematography, this workshop is for you. Discover how to use camera movement to keep viewers engage. Explore the different techniques to create effective reveals. Camera movement combined with pace can create powerful emotions. "Chris challenged us to try things that maybe the "Traditional" photographers wouldn't do, but when done appropriately, really fit in and looked great"
1What value do I get from this class? Moving with Cameras is a full suite learning experience that consists of both classroom and hands on time. 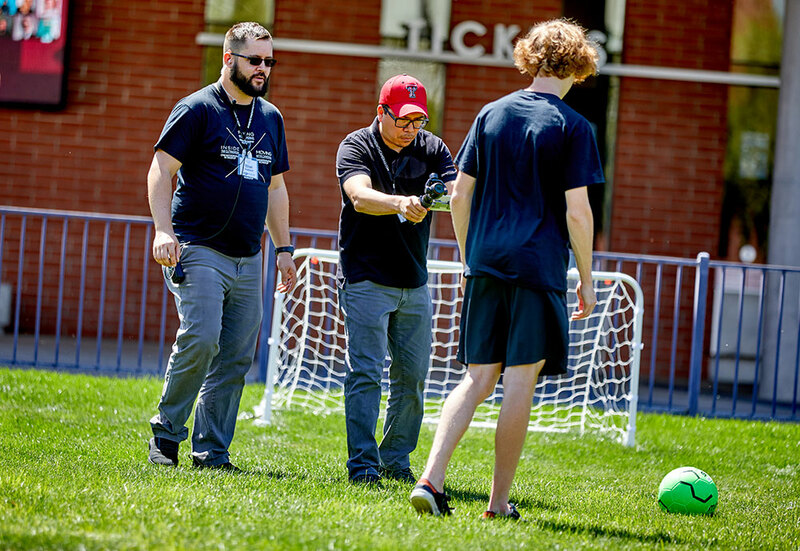 During LEVEL 1, our class allows for beginners to get an understanding of basic photography and cinematography skills when using a gimbal. In LEVEL 2, we focus on advanced concepts including but not limited to the use of movement in creating emotions and engagement. Unlike other classes we don't teach you specific equipment, rather how to move a camera and the purpose behind it. 2Do I need to bring a gimbal? 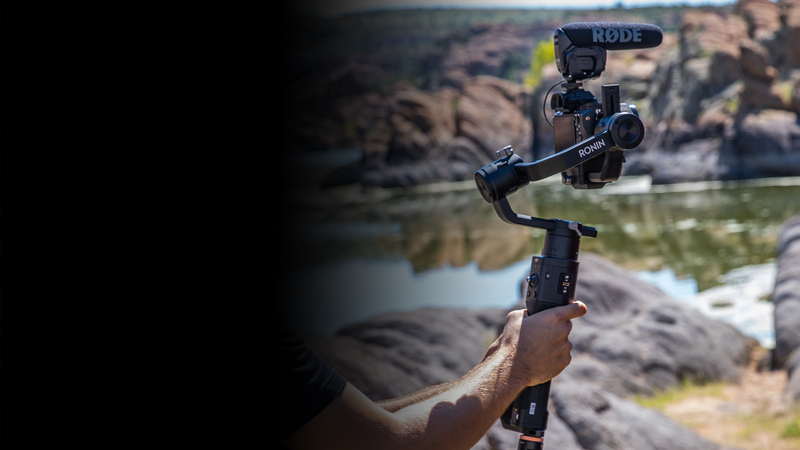 Yes we recommend bringing your own gimbal, but different models will also be available for you to use and try. 3Should I bring a memory card? Yes, we recommend you bring your own micro SD card to record and keep any footage you'll capture during the event. We recommend using a Class 10 U3 micro SD card. 4Can I bring a friend or family member? No, each attendee must purchase their own tickets. 1 Ticket per attendee. 5How much hands on time am I going to get? Throughout each day 2 hands-on session of 1.5 hours each will be set up for you to practice what was taught in the classroom. Different stations will be available with different activities to film, giving you an opportunity to refine your skills using real scenarios. 6Will food and beverage be provided? Yes, the fee for the course covers lunch and beverage. Water will be provided throughout the day. 7Can I attend both classes? Yes! Attending both classes will get you the best value from our course. We will work from the ground up to get you knowledgable in camera movement with the use of gimbals. 8Can I request a refund if I am unable to attend? Yes. Please contact info@primecinematography.com 7 calendar days prior to the event date. Any cancellations after the 7 calendar day benchmark and prior to the event start date will result in a 50% refund of the total purchase amount. Refunds will not be available for registrants who chose not to attend the event. Cancellations will be accepted in writing only and must be received by the stated cancellation date. All refund requests must be made by the attendee or credit card holder. Refund requests must include the name of the attendee and/or transaction number. You will be provided with a pen, binder with notes, and a sling bag to hold everything. Please feel free to bring any other components/items that may assist you in taking notes. We recommending wearing comfortable and casual clothing. Please remember that this is also an outdoor event, thus we recommend wearing appropriate outdoor attire during the hands on time. REFUNDS: Please contact info@primecinematography.com 7 calendar days prior to the event date. Any cancellations after the 7 calendar day benchmark and prior to the event start date will result in a 50% refund of the total purchase amount. Refunds will not be available for registrants who chose not to attend the event. Cancellations will be accepted in writing only and must be received by the stated cancellation date. All refund requests must be made by the attendee or credit card holder. Refund requests must include the name of the attendee and/or transaction number.  CANCELLATION: Prime Cinematography Consulting, LLC reserves the right to cancel an event due to low enrollment, inclement weather or other circumstances which would make the event non-viable. If Prime Cinematography Consulting, LLC cancels an event, registrants will be offered a full refund. Should circumstances arise that result in the postponement of an event, registrants will have the option to either receive a full refund or transfer registration to the same event at the new, future date.